One of the best things about this story are the phenomenal illustrations! Each page is just bursting with very true-to-life, colorful drawings of the kinds of plants and veggies you'd find in a backyard garden. The kids noticed the front and back pages, that showed plants going from seed to fully grown, with vegetables peeking out. The very cool thing about that is, it helped us connect the story to our own growing experience. We remembered when our tomatoes and zucchinis looked like those itty-bitty seedlings in the book. The story itself is cute. Groundhog used to steal veggies from other people's gardens, blissfully unaware that they were not his to take without permission. 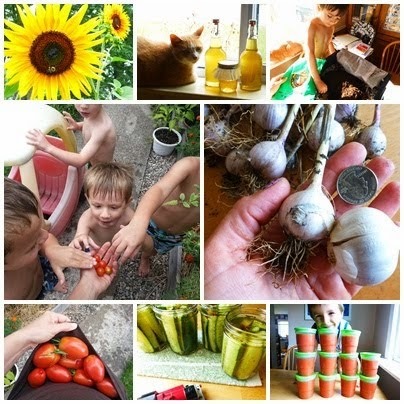 After his friends point out the folly of his veggie-stealing ways, they teach him how to grow his own garden, and eventually he and all the other garden-growers share their harvests together. Another favorite page for the kids showed the many different insects that can be beneficial to gardens. What kid doesn't like bugs? There is a nice intro from the author, Lynne Cherry, who is a life-long gardener. Apparently she has written several children's books about nature and the environment, and she speaks at schools and conferences concerning environmental issues. Now THAT is cool! She gives an address to which the reader can send a self-addressed-stamped-envelope and receive some great information about kids and gardening fun. Which of course, we are going to do!